Founded by Professor Yoshua Bengio of the Université de Montréal, Mila rallies researchers specializing in the field of artificial intelligence. 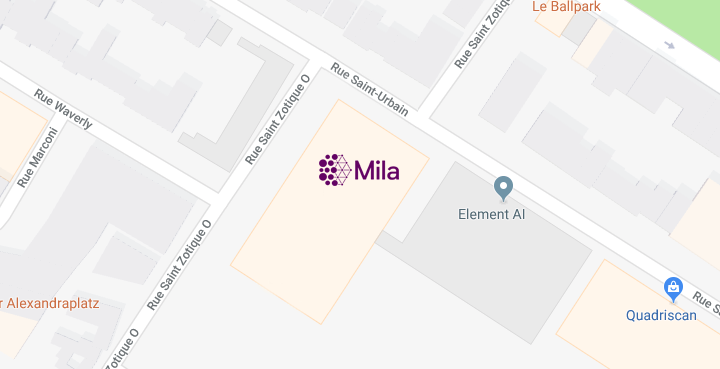 Recognized globally for its significant contributions to the field of deep learning, Mila has distinguished itself in the areas of natural language processing, machine translation, object recognition and generative models. Since 2017, Mila is the result of a partnership between the Université de Montréal, McGill University, École Polytechnique de Montréal and HEC Montréal. In addition to its academic training and fundamental research focus, Mila’s mission is to contribute to Quebec and Canada’s economic development through technology transfer and business innovation. As part of the technology transfer team, the candidate will be involved in helping companies innovate by integrating AI into their products or improving their existing AI-based solutions. The candidate will also contribute to building and fostering long-term relationships with Mila’s partners and players in the AI ecosystem. Finally, the candidate will be involved in professional training programs. Multidisciplinarity is desired. In addition to expertise in machine learning, we favor candidates with expertise in areas of application of AI such as biomedical, medical, neuroscience, law, insurance, ethics, finance, cybersecurity, transportation, agriculture, robotics, chemistry, computer vision, natural language understanding. Support companies through consulting / coaching to introduce AI into their products or improve their AI-based solutions. Participate in applied research projects with companies, academic or research institutes. Develop machine learning training programs for industry. Supervise interns from the Professional MSc in Machine Learning program. Dedicate one day per week to own research projects. Expertise in machine or deep learning (MSc, PhD, post-doc in the field, or equivalent work experience). Expertise in PyTorch or TensorFlow. Ability to lead a project and to work well as part of a team. Industry experience in machine / deep learning. Industry experience in fields of application of machine / deep learning. Proficiency in English and French. Located at the heart of Little Italy, in the trendy Mile-Ex neighborhood. Easy access to public transit. Please contact jobs@mila.quebec for recruitment.